ALEXANDRIA, VA (October 11, 2017) – The Marine Corps Scholarship Foundation announced today the appointment of Lieutenant General Robert R. Ruark USMC (Ret.) as its new President and CEO. 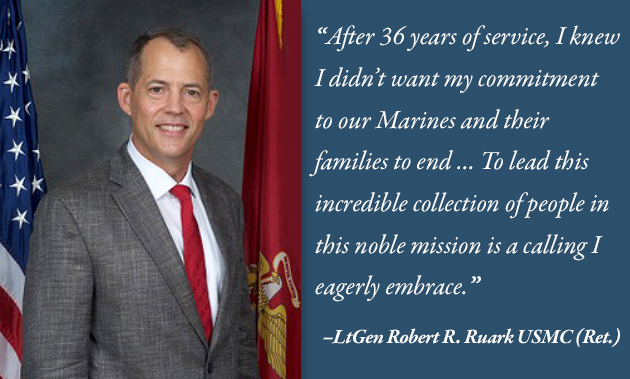 A three star Marine General with 36 years of military service, LtGen Ruark brings to the Foundation an impeccable record of leadership and innovation combined with a passion for the transformative power of education. LtGen Ruark retired from the Marine Corps in June of 2017. During his final military assignment as the Military Director to the Under Secretary of Defense for Personnel and Readiness, he oversaw a global staff of 32,000 civilians, military personnel, and contractors. Prior to his assignment with the Office of the Secretary of Defense, LtGen Ruark was the only Marine other than General Randolph McCall Pate, the 21st Commandant of the Marine Corps, to serve as the Joint Staff Director of Logistics (J4). His other General Officer assignments include service as Director of Logistics and Engineering for United States Central Command and, separately, Commanding General, 1st Marine Logistics Group during combat operations in Iraq. Born in Baltimore, Maryland, LtGen Ruark joined the Marine Corps in 1981 following his graduation with Honors from Miami University of Ohio. His academic achievements also include graduating with Honors from the Marine Corps Amphibious Warfare School, receiving a Master of Arts degree at the Marine Corps Command and Staff College, and acting as the Commandant of the Marine Corps Fellow to the Pennsylvania State University’s School of Business. Well wishes for Ruark’s tenure have poured in, including from the Commandant himself. “Congratulations to LtGen Ruark. I know he will effectively carry on the Marine Corps Scholarship Foundation’s critically important mission,” said, General Robert Neller, 37th Commandant of the Marine Corps. LtGen Ruark succeeds Margaret B. Davis who, after eight years of mission success and growth at the Scholarship Foundation, has been appointed President and CEO of Maryland Hall for the Creative Arts in Annapolis, Maryland.